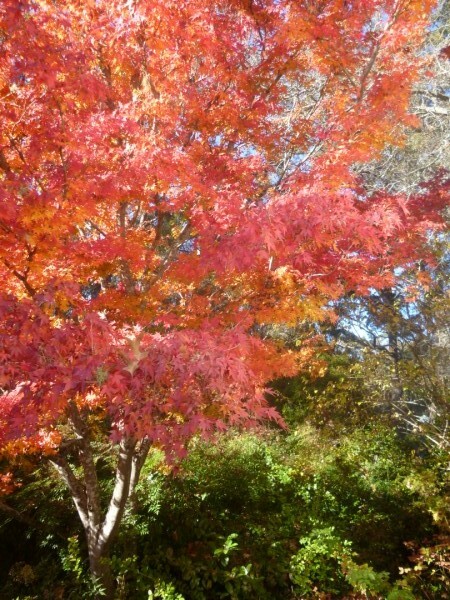 Autumn at Sturt: glorious red leaves. I do enjoy this time of year. Early morning and there’s mist through the trees. The leaves continue to fall. 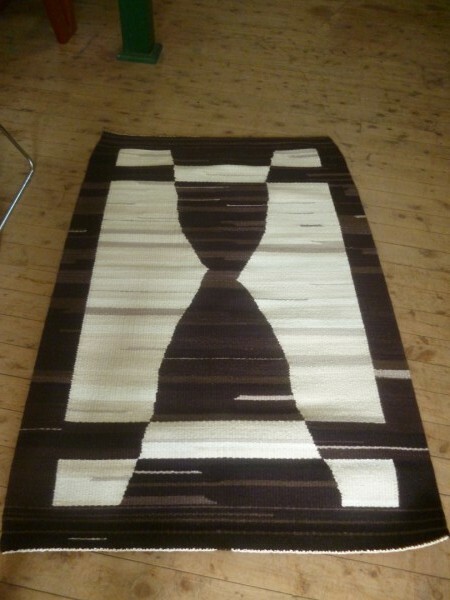 Isobel finishes her tapestry floor rug: a beautiful achievement in natural coloured wool. Tuesday completes a challenging shadow weave runner. 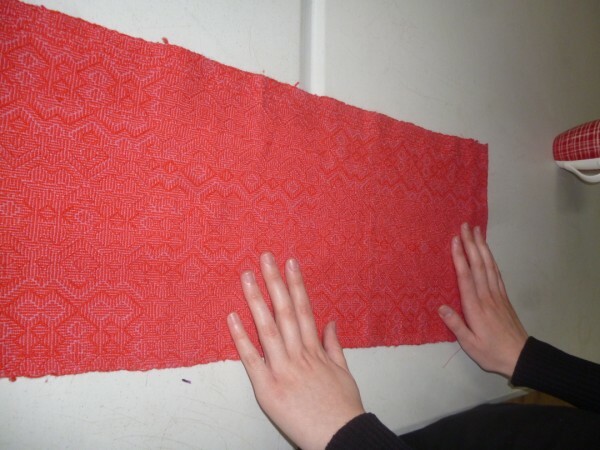 Ruth has silk yardage for a vest. The colourway is so subtle. 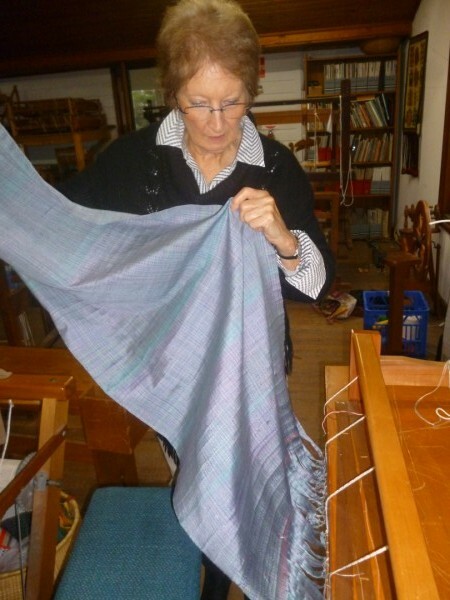 She now has to weave an additonal strip for an insert as she changed the indended use as it was being woven. A tableloom was her loom of choice because of the smaller amount required for loom waste. She had a limited amount of silk yarn and wanted to use it in the most economical way. This will be a lovely garment. Pauline’s second project. She has completed another scarf and has become the scarf queen for the term. 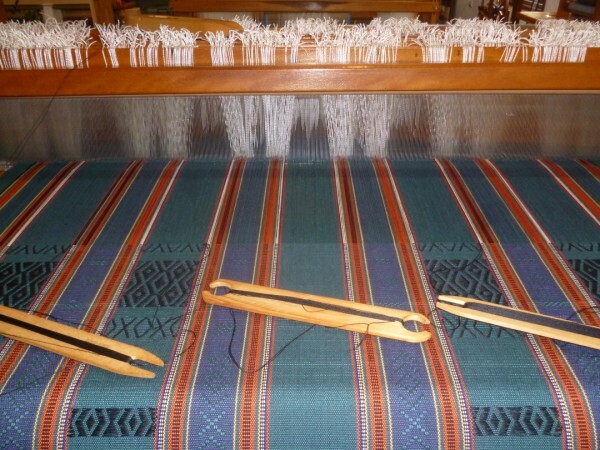 Putting a warp every third week has meant that she is becoming more familiar with getting the warp on the loom. 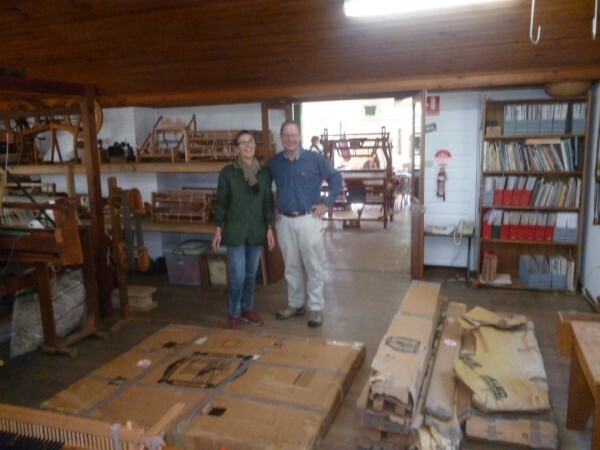 A new loom is donated to Sturt today. 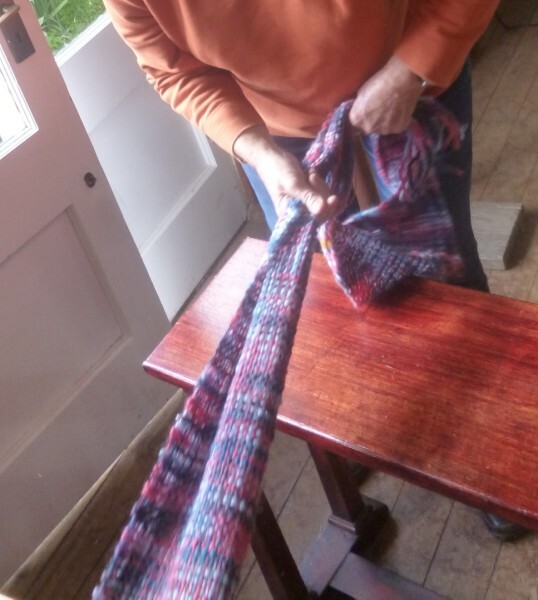 Helen delivers the loom. Thank you! All I have to do is get it unpacked and assembled. It’s a Glimakra Countermarche and I have plans for a student challenge next term. It was originally bought in 1990 and was delivered in the original boxes. This loom has travelled quite a distance before it got here. In praise of computer dinosaurs! My current piece on the loom. The computer dies. Disaster! No more weaving. But then I remembered the inherited computer in the cupboard. I wonder if it will work with this loom. 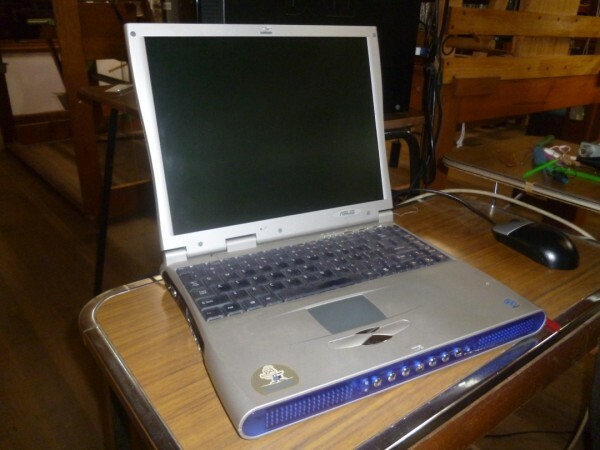 Meet the dinosaur: It’s heavy, some keys don’t work and it even has a gap for a floppy disc but…. it works! I am so thankful for computer dinosaurs. Currently the International Damask Network has an exhibition on at Waalres Museum, Nederland. This piece was accepted in the exhibition. The theme of the exhibition was “Organic”. I took the tallowwood growing beside my home as inspiration. 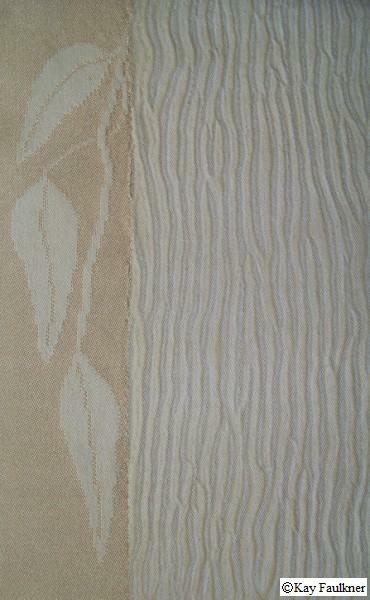 Tallowood combines a 5 end satin damask with shibori and natural dyes (Tallowood of course). Waalres Museum: hetwaalresmuseum.nl. Exhibition is on till 6th July, just in case anyone is in the area. Check out the web site of Fibre Arts, Australia to find out upcoming workshops. http://www.fibrearts.jigsy.com. Glenys also has a link to her “Conversations with the makers” on http://conversations.jigsy.com. There are many interviews there and yes, I have participated. 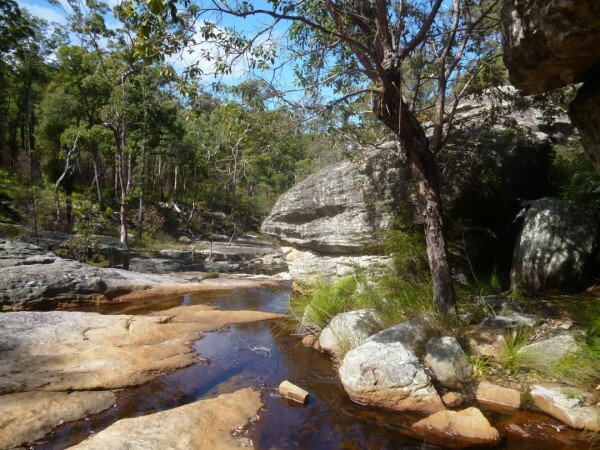 I had a weekend off and went walking in the Blackdown Tableland National Park, 180km west of Rockhampton and 110km east of Emerald in Central Queensland. It was lovely to get away and spend time in the Australian bush. What a difference to Sturt but beautiful also. 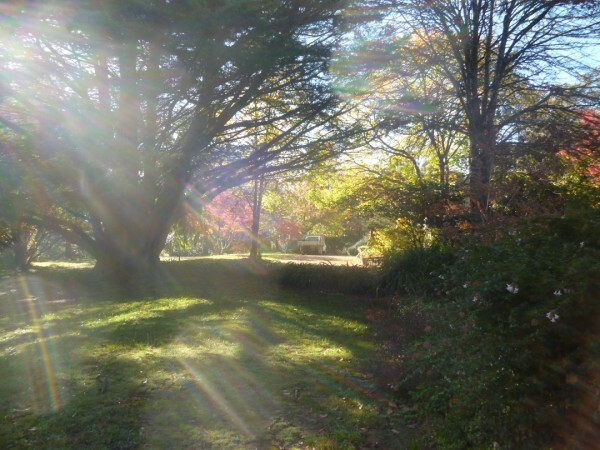 Peace, quiet and time to contemplate…. food for the soul. You are currently browsing the Kay Faulkner's Blog blog archives for June, 2014.